Greg Lake is one of our legendary ‘rock star’ supporters; and in 2011 we performed one of his songs at VIAM at the O2 ‘Watching Over You’. ” There is nothing on earth more precious than the life of a child; they are the future of the world. I am indeed proud to have my song performed as part of this most noble and worthwhile cause.” – Greg Lake, co-founder and the voice of rock legends King Crimson and Emerson, Lake & Palmer. 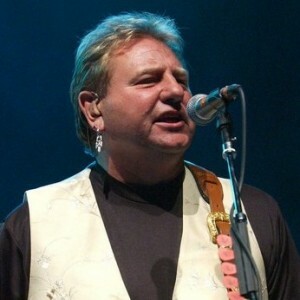 Vocalist, musician and producer, Greg Lake is one of the most prominent and popular musicians in the world and has often been described as having the voice of a generation. He first won worldwide acclaim as lead vocalist, bass guitarist and producer when together with Robert Fripp he formed King Crimson. Their first album, In Court of the Crimson King, co-produced by Greg, featured the iconic song “21st Century Schizoid Man.” King Crimson pioneered progressive rock and paved the way for famous bands that followed, including Yes and Genesis all the way through to bands such as The Red Hot Chilli Peppers and countless others. Fripp and Lake met when they shared the same Dorset guitar teacher who taught an expansive range of music including classical pieces by Paganini and post war classics. Lake also listened to early American rock and roll and was inspired by everything he heard, from Elvis to classical.